Who doesn’t like fried calamari? Let me rephrase – who doesn’t like fried calamari that’s tough and rubbery? Me. Fried calamari (squid) is one of our favorite things. If you’ve never made it, I would strongly suggest you give it a try. This recipe and method results in calamari that’s tender. The trick is to make sure that your oil is nice and hot and that you don’t cook it for too long. 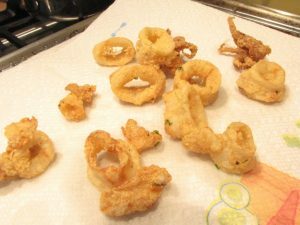 Trim the calamari into ½” rings. Trim the really long tentacles. Place in a bowl, add the milk, gently mix and set aside. Cut into rings – tentacles trimmed. 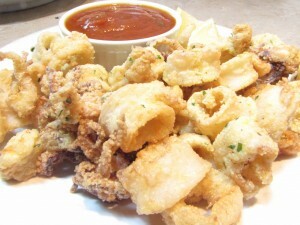 I like to use a small to medium-sized sauce pan with high sides to fry the calamari. I like to make sure there’s at least 2”-3” of oil in the pan. Heat to 350F. 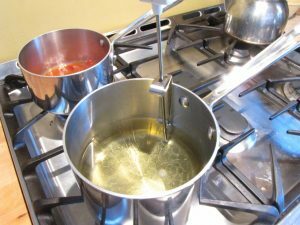 When you add the calamari, the oil will bubble up, so make sure your pan is big enough and don’t add too much at one time. 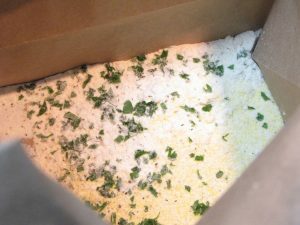 While the oil is heating, mix together the flour and cornmeal. I use a 2:1, flour to cornmeal, ratio. In other words, 2/3 cup flour and 1/3 cup cornmeal. Add the parsley and some black pepper. 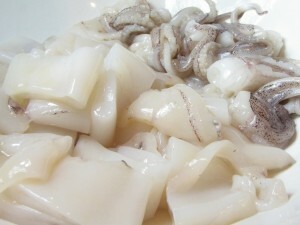 You can mix everything together on a plate and dredge the calamari or use my favorite method – a paper bag. I mix up all the dry ingredients in a paper bag and use it to dredge (or shall I say shake) the calamari. This is definitely my preferred method for coating the calamari. 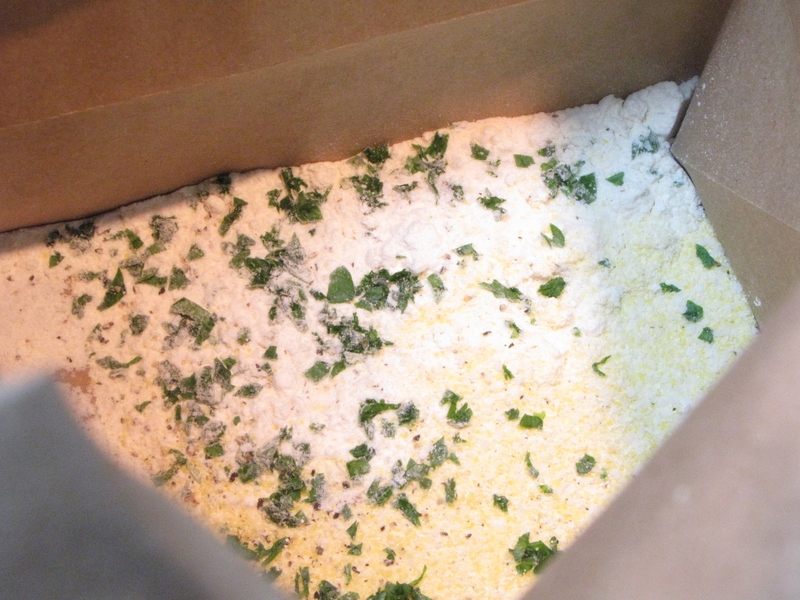 Once the oil is hot enough, shake off any excess flour/cornmeal mix and add to the oil. Depending on the size of the pan, you’ll probably have to fry the calamari in batches. You don’t want them to be crowded in the oil. Don’t overcook. Fry just until lightly golden. Drain on paper towels. Try one. See if it’s cooked correctly and then adjust the cook time of the next batch if necessary. First batch done! Crispy and tender. Serve with marinara and lemon. That’s it! I promise that if you start making calamari at home, you’ll never order it out again. Yum!